Windows 8 hardware sales are off to a slow start as shoppers scratch their heads over Microsoft's new operating system and flock to low-cost tablets instead. 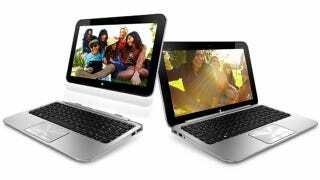 Could a souped-up netbook save the day? The latest hybrids powered by Intel Atom processors promise the best of both worlds: the versatility of a laptop combined with the portability of a touch screen slate. But now that we've tested a couple of these detachables, I've concluded that the folks who price these things are detached from reality. There's a lot of good in Windows 8, but clearly defined products and sensible pricing are two things Microsoft sorely needs. Laptop Mag Editor in Chief Mark Spoonauer explains how Atom-based hybrids are the worst of both Windows 8 worlds. It's important to understand why Atom-powered tablet-notebooks potentially represent the just-right porridge of the Windows 8 hybrid world. Unlike $499-to-$599 ARM-powered Windows RT devices like the Microsoft Surface, Windows 8 systems with Atom inside can run both traditional desktop applications and apps downloaded from the Windows Store. And while Intel Core-powered Ultrabook convertibles such as the Dell XPS 12 and Lenovo IdeaPad Yoga are faster, they cost anywhere from $999 to $1,199. Windows 8 detachables, such as the Acer Iconia W510 ($749), Samsung Ativ Smart PC 500T ($749) and HP Envy x2 ($849), sit between the two above categories in terms of price and power. These versatile combos sport designs that make it fairly easy to switch from tablet to laptop mode and Intel's Atom Z2760 processor. This CPU was designed to deliver long battery life (as much as 10 hours of local HD video playback), along with three weeks of connected standby time. Because these detachables' keyboard docks have their own built-in batteries, users can enjoy epic endurance in laptop mode. The 11-inch HP Envy x2, for instance, lasted nearly 12 hours on a charge on the LAPTOP Battery Test. The smaller W510 (10 inches) lasted an even longer 15:09 with its dock. The staying power isn't as impressive in tablet mode. The Iconia W510 lasted 8 hours and 49 minutes, which is better than the ARM-powered Surface RT (7:43) and Vivo Tab (6:33) but still 3.5 hours behind the fourth-generation iPad. The larger Envy x2 lasted a fairly short 6:52, about an hour less than the average tablet. Unfortunately, Atom-powered Windows 8 hybrids are just too slow to justify the premium. On PCMark 07, for instance, the W510 scored 1,305. A $549 11-inch ultraportable laptop such as the Acer Aspire V5-171, which sports a Core i5 CPU, notched 2,427 on the same test. That's 85 percent faster for $200 less. Atom-powered detachables also trail their Core-powered cousins in real-world performance tests. On our Spreadsheet test (matching 20,000 names to their addresses), the W510 took 29 minutes and 56 seconds and the Envy x2 29:45. That's five times as long as the cheaper Aspire V5 notebook (5:48). Thinking about editing video? The HP Envy x2 took nearly 6 minutes to transcode a 5-minute HD video to iPod touch format. For those scoring at home, that's slower than real time. The average ultraportable laptop takes 1:08. These Atom-powered convertibles are also saddled with slow flash memory. While both the Acer and HP booted Windows 8 within 20 seconds, they took their sweet time on our file transfer test. The average ultraportable laptop offers a transfer rate of 77 MBps, compared with a measly 22 MBps for the Envy x2 and 10.8 MBps for the W510. Here's another example of how Atom-enabled hybrids will keep you waiting. It took the W510 8 seconds to open a 50MB PowerPoint presentation, versus 2 seconds for the Iconia W700 with its Core i5 CPU and 128GB SSD. At least the W510 beat the ARM-powered Surface's 13 seconds. Keep in mind that you're getting half as much storage as comparably priced Ultrabooks. The W510, Envy x2 and Samsung Ativ Smart PC 500T all come with just 64GB of flash memory. That's fairly good for a tablet but not for a notebook that's priced in the $749 to $849 range. You can get a full-fledged Ultrabook like the Toshiba Portege Z935, which features a fast Core i5 processor, 4GB of RAM and a 128GB SSD, for $799. By the way, the Toshiba weighs 2.4 pounds, compared with 3.1 pounds for the Envy x2, though only the latter has a touch screen. As a notebook, the Acer W510 suffers from a cramped keyboard (about what we'd expect from a 10-incher), but even the 11-inch HP x2 fell flat in terms of feedback and comfort. We hope the Samsung Ativ, which also includes a pen for input, is better. How good are these hybrids as tablets? Well, the 11-inchers not only are larger than the iPad but are heavier at 1.5 to 1.66 pounds, making them a bit awkward to hold for extended periods. The 10-inch W510, on the other hand, is lighter than the iPad at 1.2 pounds. No matter which size you choose, though, you'll be disappointed in the shallow selection of apps in the Windows Store. As a concept, Atom-powered Windows 8 hybrids have potential, but they ultimately don't deliver the best notebook or tablet experience. I wouldn't say they represent the worst of both worlds, but I certainly wouldn't charge as much as $850. It's just too close to Ultrabook territory when you're not getting anywhere near that kind of performance. A $650 price tag would seem much more reasonable. Windows 8 device makers will lose more on each hybrid sold, but they'll be able to manage expectations while Microsoft and its partners continue to fill the Windows Store with more apps.